I set out to find a simple answer to a simple question: Why is there no meat in mincemeat? It was going to be a tidy tale of how a misnomer was born. Look up a few websites, collect a few facts, wrap them in a nice story, and on to the next project. As so often happens, however, my research took a rather circuitous path as I kept discovering connections and facts that I’d had no inkling of when I started out. The story of mincemeat is more interesting—and convoluted—than I ever imagined. Mincemeat is, I must confess, a topic about which I have never felt much passion. In my family, mincemeat pie was simply one of a half dozen standard Christmas dessert choices. I rarely had room for more than two, and in my personal hierarchy of dessert preferences, mincemeat ranked well below Johnny Bull Pudding and blackberry pie. On the occasions I did eat mincemeat pie, it made no particular impression on me other than provoking a vague curiosity at its name, since whatever the filling was, it clearly did not contain any meat. One explanation for the name could be that in Old English, the word meat had the more generic meaning of “food,” whether or not it happened to come from the flesh of animals. Thus, a mincemeat pie would actually have been a “minced food” pie, which could have been anything. However plausible this may sound, however, this explanation turns out to be incorrect (or at least misleading). Centuries ago, mincemeat was so named for the very straightforward reason that it contained minced animal flesh (and in fact sometimes still does—more on this later). Beyond that, the details of its provenance and development are hazy. I have read a few unsubstantiated reports stating that mincemeat pie was served at least as far back as 1413, at the coronation of King Henry V of England, and that further, it was a favorite of Henry VIII. There is no record of the composition of these early dishes, but recipes dating from the early 17th century list a variety of wild game, plus eggs, fruit, spices, and sweeteners. According to some accounts, early mincemeat pies were small, like tarts; according to others, they were immense, weighing as much as 220 pounds (100kg). In any case, meat and fruit were invariably included among the ingredients. Going back even further, however, there are some who believe mincemeat pie is based on an ancient pagan tradition of serving coffin-shaped cakes representing Osiris—the Egyptian god who, according to legend, died and was resurrected each year. This ritual took place on the winter solstice, December 21, and this very festival was later co-opted by Christians looking for a convenient date to celebrate Christmas (and stamp out pagan influences in the process). 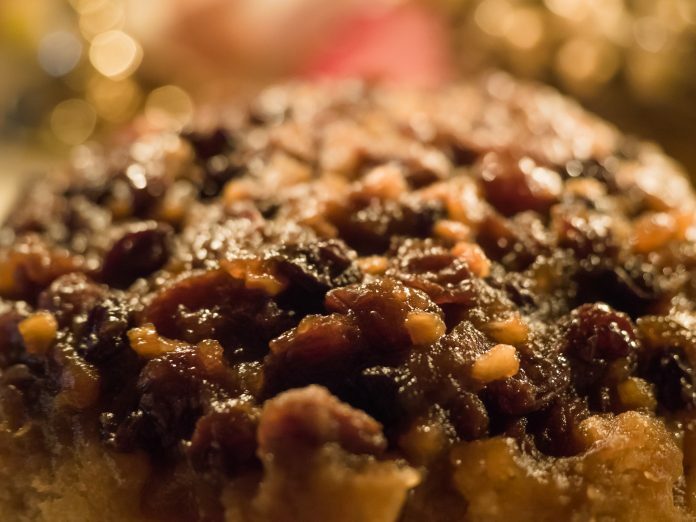 Along with the Yule log and the evergreen tree, the mincemeat pie is arguably a remnant of the original pagan celebrations that persisted when the holiday was refashioned. Puritans in the 17th century felt that Christians had no business observing the birth of Christ by eating, drinking, and merrymaking—certainly not on a pagan holiday, and using pagan symbols. So the English Parliament, controlled as it was by Puritans, abolished Christmas celebrations in England in 1647. Years later, authorities in Connecticut and Massachusetts banned Christmas celebrations there too. The prohibition specifically disallowed mincemeat pies, which were characterized as being sinful both for their symbolic origin and their inherent richness. But Cromwell’s attempt to put the last nail in the coffin of mincemeat failed; it rose again. Within two centuries the ban on Christmas had been all but forgotten, and mincemeat was once again a staple in both Christmas and Thanksgiving celebrations. But over those years mincemeat had undergone a change in character. Perhaps as a way of obeying the letter of the law while maintaining tradition, some people had begun to leave out the meat in mincemeat, replacing it with nuts, apples, and raisins…along with brandy or rum. That, in short, is why the name doesn’t always match the ingredients. This leaves the question of why anyone would think to mix meat and fruit in a pie in the first place. This notion seems to elicit “yuck” responses from many people, but I don’t see why. Sweet and sour pork contains pineapple; some curried meat dishes contain raisins. There’s nothing unnatural about mixing meat and fruit. It’s just not common to see them together in baked goods (though I have frequently said that the idea of chicken cinnamon raisin cookies sounds good to me). One commentator opined that the mixture was simply a method of preservation, as the combination of the acids from the fruits and the heat from baking inhibited the growth of bacteria in the meat. That seems vaguely plausible, though I prefer the simpler explanation: it just tastes good. Today, a few recipes for mincemeat (and some brands of jarred mincemeat) do indeed contain meat, but of those that don’t, most of them still contain suet, the hard layer of fatty tissue surrounding the kidneys of cattle. To be sure, this doesn’t sound like an appetizing dessert ingredient. And yet, it turns out to be one of the main ingredients (again, along with raisins) in Johnny Bull Pudding, the dessert I customarily ate on Christmas instead of mincemeat pie. There’s just no escaping tradition. Note: This is an updated version of an article that originally appeared on Interesting Thing of the Day on October 28, 2003, and again in a slightly revised form on December 20, 2004.